Brome Eatery is finally in Detroit and we were able to experience it first hand during a Michigan blogger networking event with fellow lifestyle and fashion bloggers eager to eat and network. Thank you to @bedazzledbritt and @emjoanne13 for hosting the lovely lunch. Why was Brome a good option for the event? The space offers great views of the city and the smoothies and food were great too! The location just opened a few months ago and I was eager to try it out! Brome attracts those who eat organic and who like to eat well in support of healthy eating choices and with respect for local farms and farmers. The salads were my favorite and the smoothies, made with Stevia, on the second floor at Balence, were divine as well. 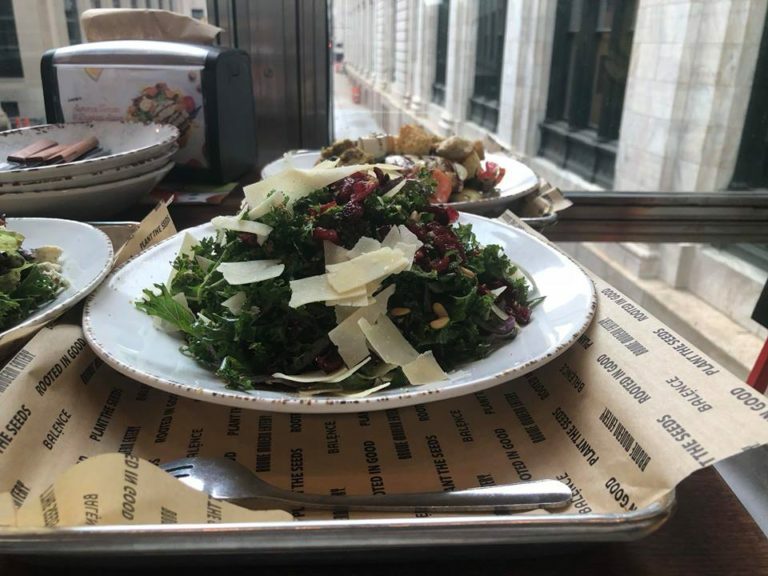 Of course, they have other food options like burgers, tater tots and desserts that fill the menu but I tend to only eat salads, chicken and smoothies so I was quite happy with the options available to me. I definitely found my favorite lunch spot downtown when on the go. For me, a power smoothie and a healthy salad is always needed in between appointments during a busy work day. I’m thrilled Brome has opened up a downtown location and I encourage you to check it out! Their shelves are made from wood that was pulled from the Dearborn railroads (city adjacent to Detroit) when the Dearborn Amtrak Station was being renovated. The beams were originally installed in 1884 and the wood was 150 years old at the time; which makes each beam 250 years old today. The wood was repurposed by Detroit Reclaimed Woodwork and Art and is being used as shelving throughout the eatery. It’s pretty cool and gorgeous and amazing to see all at the same time. The Brome Eatery Detroit location is located at 607 Shelby Street. Balence is located on the second floor from the Eatery and serves divine views of the city including yummy smoothies for all to enjoy! Have you been to Brome Eatery or Balence? If so, please share with me in the comments below, your favorite menu choices and favorite experiences. I’d love to hear from you! Disclosure – This post is in partnership with Brome Eatery and may contain affiliate links. By clicking and shopping, you help support Glamorous Moms and allow us to keep reporting on all things glamorous.